Here are the things I have done to help my hand, wrist, and arm begin to recover. 1. Rest. It was hard to make myself do it, but I had to rest! My body was forcing me to do it anyway. If you’re like me and you like to keep going, please remember that by resting more now we can avoid worse problems later. 2. Brace. I happened to find a really good Creative Comfort glove with a palm cushion and brace at a Tuesday Morning store. This is an affiliate link to some similar products on Amazon. The brace I got has worked really well to stabilize my hand so that I don’t accidentally turn it the wrong way and cause myself pain. It also helps me to hold my hand the right way if I am trying to do something. I was doing some reading on the topic and it appears that using this kind of brace while sleeping may be of benefit. I haven’t tried this yet. 3. Pain Killers. I took Aleve. It just helped to lessen the pain but did not entirely eliminate it. 4. Adjustment of Office Ergonomics. I read a couple of articles about the best positions for typing and mousing and I implemented a few quick changes that cost nothing. I got my ideas from this article. 5. Doctor. Yes, I finally broke down and scheduled a doctor’s appointment. This is my second bout with this pain and this time is worse and has lasted longer than the first! I don’t like this trend and I don’t want to end up with a chronic problem. 6. Exercises. Even though I didn’t want to move my hand too much, I did modified versions of these exercises yesterday and I felt a difference immediately and also today. I did them while wearing the brace and very, very, very gently (and some of them not at all) with my hurt hand. I did them normally on my good hand. About Preventative Care. I may have been able to avoid this by being more disiciplined about taking breaks while working the keyboard at work. I also could have engaged in stretches and strengthening exercises for my wrists and hands. When I’m better I will definitely do some exercises to strengthen in hopes that I may avoid this in the future. So what about you, my friends? What have you done to deal with hand, wrist, and arm pain? Do you do any preventative exercises? Please leave your thoughts, stories, ideas and questions in the comment section below. I’ll update you on my recovery in the comments, too. This entry was posted on Tuesday, May 19th, 2015 at 12:00 AM by Caissa "Cami" McClinton	and is filed under Fun Ramblings. You can follow any responses to this entry through the RSS 2.0 feed. You can skip to the end and leave a response. Pinging is currently not allowed. I have been dealing with carpal tunnel and tendonitis for years now, and as I’ve aged, I get to deal with arthritis too. Many years ago a Dr. ordered wrist splints when sleeping which does help considerably. I also checked out your exercises and many of them seem to be from The Carpal Tunnel Solution by The Carpal Tunnel Institute (which I highly recommend! ), but be careful with the thumb pull – it can give you tendonitis. At one point I was really having a lot of pain, and I found a Dr. that could give cortisone shots to the wrists, but you needed to spend a couple days doing nothing to get the best benefit. I also researched supplements and found that Vitamin B6 (100mg 2x a day – NO MORE) is a nice nerve pain killer and that Bromelain is a good anti-inflammatory. I also have to take Mobic (another anti-inflamatory), but that’s by RX only. Note that B6 and bromelain have to be taken for a few months before you reach full effect. I have chosen to go the route of the supplements, splints and exercises to avoid the surgery. Besides, the surgery is only good if you stop doing what you did to create the carpal tunnel in the first place. If you don’t, eventually the carpal tunnel comes back. Certainly, do your own research, consult with your Dr., and deal with this the best way for you. Just putting it out there so it may help someone! I had surgery several years ago and I have not had a problem with continuing to crochet nor has the CTS returned. Maybe I am a unique case, but I have not had the symptoms return and it has been about 15 years since my surgery. Is funny how you posted about this today. I was suffering the same way and for weeks now I could only do about five minutes of knitting or crochet. I was worth my rheumatologist yesterday and he diagnosed tennis elbow in both arms. He gave me steroid injections in both arms and told me to rest for a week or two to let them work. Thanks for the link to the wrist supports. I’ve been looking for these for quite a while now. Thanks so much for this post. I am new to crochet (about a year) but I crochet every day and I am experiencing some pain myself. My left hand cramps up at my pinkie and ring finger so that it looks like a claw, and it puts an end to my crocheting for at least an hour. My wrists have had pain as well. Like you, I went in search of something to help. I got a pair of Tommy Copper gloves. I am NOT a Dr. This worked for me, my experience.They keep my hands stretched out so they don’t cramp up and they come up past my wrists so they are supported as well. They are helping. The only thing I have found to alleviate the problem all together is not crocheting. That’s NOT GOING TO HAPPEN. Great post. I hope it gets better for you. Thanks for sharing. Sorry to hear you are dealing with this. I have worked on a computer keyboard all day every day for over 20 years. For many of those years, I took a couple of 5 minute breaks per day for ergonomic exercises. I have also always enjoyed doing arts and crafts. I started crocheting about 3 years ago. I got “trigger thumb” in my left thumb within the last year or so. I went to an orthopedic specialist and got a cortisone shot in my thumb. It was very painful, but effective. Within 6 months, I got trigger thumb in my right thumb. I went right away and got a cortisone shot in that thumb as well. Since then, I have had no problems to that degree. 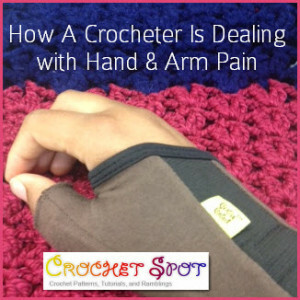 I experience minor aches and pains all the time while crocheting. I stop for awhile and rest or stretch. I make sure my back is well supported. I would not crochet until cramping up or getting shooting pains. When you work a lot with your hands for years, you are probably going to get some type of repetitive stress injury, it’s just a matter of time until things progress. My personal choice was to go to the doctor right away and get treated. I am not going to stop keying on the computer, or stop crocheting or doing other crafts. I have found that gel wrist rests for both the keyboard and the mouse help support the wrists a lot. Whatever you decide, best of luck to all crocheters with this issue. good advice! best to start out with non-invasive treatments such as exercises and heat/cold. I am always looking for the least aggressive way. If you are going to take ibuprofen, suggest you check for the dose used for an acute situation (plenty of reputable sources on line)and it does work better if taken 3-4 times a day to build a level; usually continued for several weeks or longer. I have also found that arnica massage oil works well for pain relief; takes about 15 minutes to work and lasts for several hours, but is safe to use repeatedly unless you have an allergy to some of the ingredients. Wrist splints do give support during the day but are cumbersome and awkward-no getting around that; the reason for wearing them at night is to maintain good position as we all like to curl up and tuck in our hands when sleeping; this causes more compression on the nerves involved. This is a very common problem for folks doing repetitive motions for work and hobbies. ; and where would we be on phones without using thumbs? proper exercises and stretches and avoiding long periods of crocheting without breaks will help. good luck! My hands do ache sometimes, but the thing that bothers me most is I get a sharp shooting pain in my index finger. it usually goes away very quickly, but it just stops me in my tracks. Hey I have pain in my right arm and neck so I took corrective action . I limit crocheting to 15-20 min at one time. Also I got started on yoga exercises for my arm, shoulder and neck . Most of the back bend exercises work wonders!the breathing is very important as it makes a great difference. If the name help I do tad asana, katichakrasana, and, bridge asana, pawanmuktasana, dhanurasana, bhujangasana and shavasana. These are basic but work superbly. Hope they work for u guys too. I needed this advice, thank you. Seniors are not the only folks that get carpel tunnel and arthritis in their hands, wrists and fingers, especially if you use them for repetitive movements like keyboarding and crocheting. My husband bought me a pair of fingerless gloves that have copper imbedded in them from a company called Tommy Copper. They do keep my hands warm. I have seen similar stress relieving copper gloves sold in JoAnn Crafts. When the arthritis in my thumb acts up (boy it hurts!) I find some other creative way to hold the hook. I believe that there are photos of different ways to hold the hook on Crochet Spot and Joann Crafts. When the torn ligaments in my shoulder act up, I get out the heating pad and brace my shoulder and arm in the chair. 2 Extra Strength Tylenol help. The braces in the photos are used for carpal tunnel syndrome. I started developing the same type of pain, numbness, tingling, pain up my arm and into my shoulder as well. I tried lots of things, finally went to a specialist who diagnosed Carpal Tunnel Syndrome. I had surgery on both of my wrists, and am not sorry I did. I haven’t had any trouble since then and my surgery was several years ago. The point is, eventually the meds stop working and they are only covering up the pain anyway. The problem will only worsen and if you wait too long, it will be more complicated. Recovery time from surgery was remarkably short for me and I was back doing what I loved within a week or two. I wish you the best as you decide what is the best for you. Bi-lateral Carpal Tunnel surgery was one of the best things I did for myself! I have had this too! Mine was related to gardening as well. I connected with a great PT. She really listened to me. I tried to pay attention to how I hurt and where. She wodied on my posture and the mechanics of how I do things. Good luck, but it takes time. I am dealing with pain myself. I went to my hand Dr and he said i had de Quervain Syndrome (sp? ), ie: tendonitis of the tendons going up outside of my thumb to my wrist and hurts to use thumb and wrist. Forget about even opening a water bottle etc. Dr gave me a cortisone injection and I had been wearing a brace similar to yours and he said that was perfect. Said to wear it for a month or until pain subsides. He said if it comes back within a year he will talk surgery. He said it is like carpel tunnel of the thumb down at the base. It’s been less than a week and I am feeling an improvement. Glad ur catching & treating ur pain EARLY – my pain is in my right (crafting) arm, elbow & shoulder – I guess tendonitis or tennis elbow, tennis shoulder – I was hoping there was a surgery that could help like there is w/carpal tunnel but my nurse practictioner says that there is NOT, boo hooey. My elbow hurts so badly at times that when in bed at nite I have to use my other hand to lift my right arm up to move it – when it’s worst I take 600 mgs. of Ibuprofen which helps. My nurse practictioner offered physical therapy to me which I haven’t yet done as to me that would only be a temporary fix, wouldn’t the problem just come right back if PT was of any help to begin with? I sure would think so since she says there’s no cure &/or surgery to help. Heartfelt Very best wishes & good luck to you & to ALL others dealing with such pain or any pain of any kind. I’m a CNA and was injured at work about 8 months ago. I had a patient grab my wrist, squeeze as hard as he could, and pull hard on it. I was diagnosed with De Quervain’s (sp?) Syndrome and after about 2 1/2 months everything seemed to be back to normal and I was given the green light. I eventually left that facility and went back to home health but I’ve recently been packing a lot of boxes at home and the pain has returned full-force. It seems I have to make a trip to my regular Dr. and find out what’s going on. I’ve tried hand/wrist exercises but they don’t seem to help. I’ve been using my brace as often as possible, even while sleeping, but it still hurts and it isn’t getting any better. So it looks like I’m going to have to go see the doctor…not looking forward to it…at all.